I have been working super hard on developing a vegan ice cream non-recipe for you. I have eaten countess batches of ice cream, and tried several flavors (you have been privy to a few). I am now sharing the basic vanilla and giving you basics that I have learned through my experimentation. I hope you get to make a few batches before the end of summer. Combine the coconut milk and scraped vanilla pods in a small saucepan over low heat. Heat gently for about 15 minutes to steep the vanilla pods, then remove from heat and allow the milk to cool to at least room temperature. Once cool discard the vanilla pods and combine the coconut milk, beans you scraped from the vanilla pods, vanilla extract, agave nectar, and salt and blend together briefly. What is important for successful ice cream? Texture. For the perfect creamy texture you need several things: a creamy base (full fat coconut milk), a sweet syrup (agave nectar, maple syrup, or if you must, corn syrup), and, if you like, a bit of alcohol to prevent the ice cream from freezing fully. Ratio: I have found the ratio to be one can of coconut milk (13.66oz) I have been using Thai Kitchen Organic Coconut milk at room temperature, 3 tablespoons of agave nectar, and one tablespoon of alcohol per batch. Blending: I like to blend the mixture before freezing as it adds air which makes a lighter, creamier, easier to scoop finished product. Coconut milk: There are a few important things to know when using coconut milk. You HAVE to use full fat. You need the fat to make the ice cream creamy, and that is what ice cream is supposed to be. You also need to make sure the coconut milk is fully liquid. Many brands contain emulsifiers that keep the coconut milk from separating. If you are using an organic brand, or one that separates make sure it is fully smooth. You might need to heat it to melt an combine any solid pieces. I also recommend blending everything briefly. This makes sure the solids are combined, and also give the mixture a little extra air making the final product a bit lighter and fluffier. A little bit of alcohol keeps the mixture from freezing fully if it sits in the freezer overnight. You can simply omit it if you do not use alcohol, but the texture will be a bit different. I like to use alcohol as the flavor, or part of the flavor in many recipes. In this recipe I used homemade vanilla extract which is simply vanilla bean pods steeped in vodka for a few months. In essence, I am using unsweetened vanilla vodka. 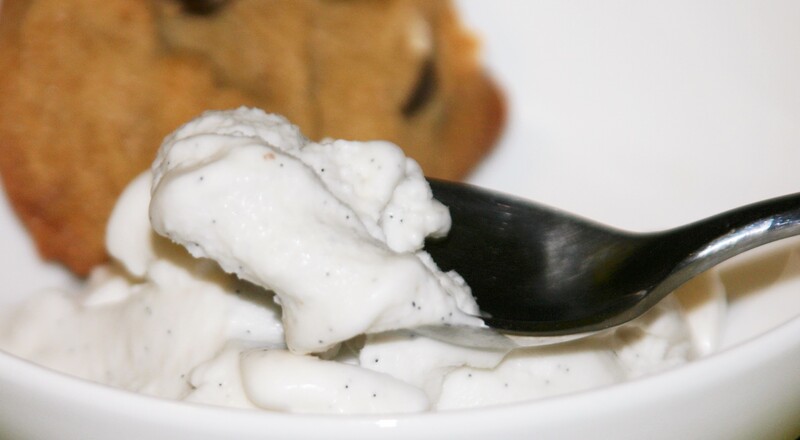 You need something to make everything stick together and be creamy, and also to sweeten the ice cream. I use agave nectar for this, or maple syrup if you want a maple flavor. I have read you could use corn syrup, but I haven’t tried it yet. I use 3 tablespoons per can of coconut milk. You can use more, I just don’t like it super sweet. Flavor. Obviously flavor is important when making ice cream. This recipe is vanilla because it is basic. You can see from my mint chocolate chip and amaretto ice cream different ways to add flavor while keeping the same basic base. You can add flavor in a few ways; you can simply dump stuff in like the extracts and alcohol, or you can steep things in the coconut milk as you warm it gently before freezing it. The steeping method would be good for tea bags, vanilla bean pods, or something you want to melt. You can also add things in after the ice cream has frozen in the machine, but before putting it into the freezer. You would add pieces of cookie, peanut butter, any chunks of stuff at this time. You do this so the ice cream freezes consistently in the machine. You do want to keep in mind that even though you are adding these in at the end, they will affect the flavor. I want to address salt for a minute. I call for a pinch of salt in all my ice cream recipes. Salt opens up your taste buds and allows the other flavors to shine. You do want to add it, but just a pinch. It shouldn’t be a flavor you can identify in the finished product. I use a Kitchenaid attachment ice cream maker. It is the only one I have used. If you use something else I would love feedback on how they work and if you need to make adjustments to the recipe for other machines.